Pomegranates are among the healthiest fruits on earth. They contain a range of beneficial plant compounds, unrivaled by other foods. They are popular in Eastern as well as Western parts of the world. The crop is cultivated in Spain, Iran, India, Turkey, South East Asia, Afghanistan, tropical Africa, parts of the USA etc. These fruits also processed to make juice, syrup, jam, jelly, wine, to flavor cakes, baked apples, etc. Also, its nutritional and medicinal values are given ample importance. Here on this page we will see some of the most useful health benefits of pomegranate here on this page. Are you pregnant and looking for healthy ways to increase your nutrition intake. Yes, pomegranate juice is safe to consume during pregnancy. Pomegranate juice contains many nutrients that are especially important during pregnancy such as folic acid, vitamin K, and potassium. It is also contains healthy antioxidants that protect your body’s cells and DNA from damage. But don’t forget to factor in calories from pomegranate juice, and other caloric beverages, into your daily intake goals. It contains necessary vitamins, mineral, niacin, calcium, potassium,as well as folic acid and fiber, all of which are essential in a prenatal diet and encourage cell growth. The anti-inflammatory properties help improve blood flow for both the mother and the fetus. The potassium in it prevents muscle cramps associated with pregnancy and is even believed to prevent premature child birth. The pomegranate is known as the super food. Its jewel-like seeds also called arils has been widely used for medical purposes. One of the oldest known fruits is an original native of Persia. This nutrient dense, antioxidant rich fruit has been revered as a symbol of health, fertility, and eternal life. Inside it, they are filled with pink arils with seeds inside that are juicy and sweet. Studies all around the world have been conducted on the health benefits of pomegranate juice. According to researchers, expectant mothers who are at risk of having a baby with a premature birth may want to consider drinking pomegranate juice to help reduce the risk of their baby having a brain injury caused by low oxygen and reduced blood flow. Studies also show that women who drink pomegranate juice have had relief from hot flashes and other menopausal problems. Vitamin C: 30% of the RDA. Folate: 16% of the RDA. Potassium: 12% of the RDA. Health Benefits of Pomegranate as a rich source of vitamins and minerals. It is rich in nutrients, antioxidants, vitamin C, vitamin K, manganese, phosphorus, magnesium, calcium, zinc, and iron. There is very little fat in a pomegranate and it does not contain cholesterol. The fruit only has 130-150 calories, with around 105 calories being derived from the seeds. These seeds are high in calories because they contain unsaturated oils, sugar, and carbohydrates, but there is a great deal of fiber and some protein in these seeds as well. Pomegranates are surprisingly high in fiber and one of the most important nutrients for sustainable weight loss. High fiber foods make you feel fuller and restricts you to overeat. Punicic acid is one of the main constituents in it, which helps to lower cholesterol level, triglycerides and reduces blood pressure. Its juice also acts as a blood thinner and helps to remove plaque from the arteries that will help to minimize the risk of atherosclerosis. Consuming it can help lower LDL cholesterol and increase HDL cholesterol to improve heart health and reduce the risk of cardiovascular problems. Pomegranate peel, bark and leaves are used to maintain the disorders of the stomach or diarrhea caused by any kind of digestive problems. Its juice is also helpful in the treatment of dysentery and cholera. It is useful in treating and preventing various cancers including prostate cancer, lung cancer, breast cancer and skin cancer. Its juice can inhibit the growth of tumor cells and induce natural death in them. Certain compounds in pomegranates have an anti-inflammatory ability that also contributes to its anticancer property. For diabetic patients, eating them regularly can reduce the risk of various coronary diseases. Along with this, there is a reduction in the hardening of the arteries, which can inhibit the development of various heart diseases. The enzyme inhibitors in its juice can help to prevent damage to the cartilage. It can also help to control cartilage degeneration to prevent osteoarthritis. From ancient times, its juice has been used to treat diarrhea and dysentery as it increases the production of enzymes that assist in digestion. 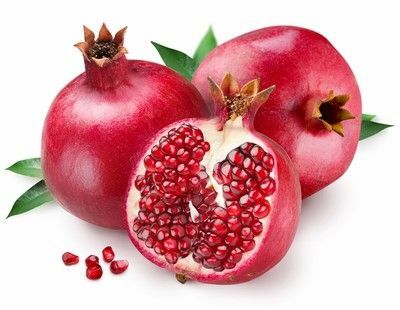 Heme Remedy to treat indigestion, add a teaspoon of honey to a glass of pomegranate-juice. They are rich in vitamin C, which boosts antibody production and development of immunity. Also they contain anti-inflammatory compounds, which has extreme health benefits to those who are suffering from immune-related disorders like rheumatoid arthritis and osteoarthritis. 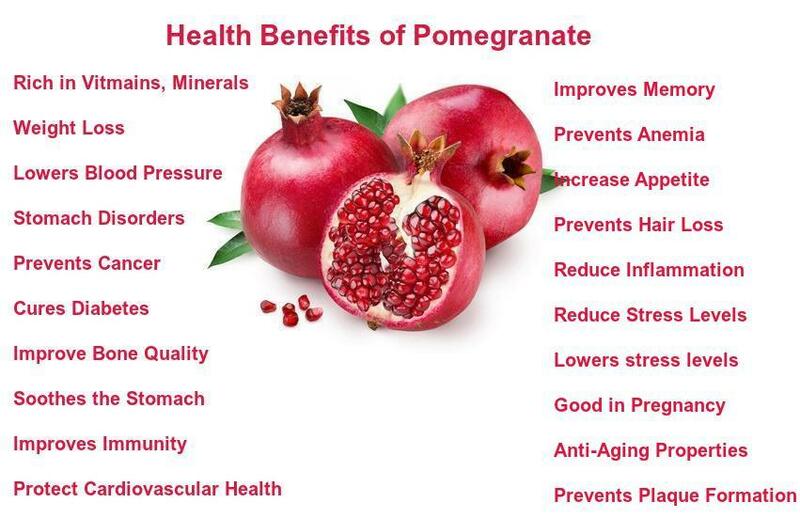 Health Benefits of Pomegranate to stimulate appetite. 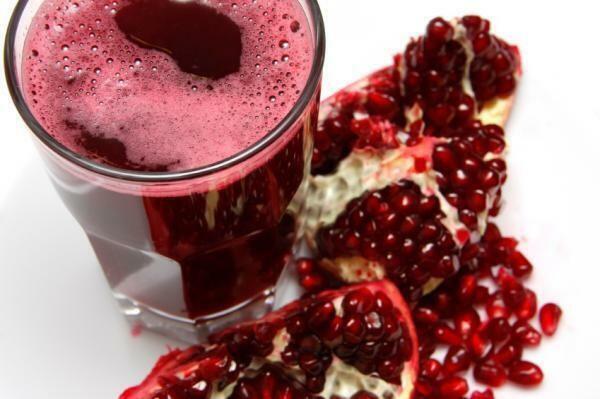 Those who don’t have a strong appetite can drink a glass of pomegranate juice to get an appetite stimulant.